Successfully managing to breed your tropical fish is one of the most exciting and rewarding things you can do. Suddenly finding yourself responsible for their offspring, however, can be a bit of a shock. Most species of fish don't care for their own young. What can you do to ensure that some survive? As soon as you notice the belly of one of your fish beginning to swell, it's time to start making plans. Sometimes you will only have a couple of days before the birth. Make sure you have read up properly on the fish species in question - a few species of fish do care for their young, in which case separating them can be a very bad idea. It is possible to raise baby fish in your main tank, but generally, few will survive this. Larger fish will see them as tasty snacks and even vegetarian fish may be tempted. They can also suffer injuries from being chased and bullied. If you do keep them in the main aquarium, make sure they have plenty of hiding places among rocks and plants. The easiest way to care for baby fish is to set up a separate aquarium in which they can spend their first few months of life. You can speed up the set-up process by using substrate and water from your main tank. Be careful to avoid using filtration equipment with small holes that the fish can get inside, and avoid filters that push small bubbles through the water, as these can get trapped under growing scales and be very painful. Baby fish naturally seek out hiding places and will be stressed without them even in an environment where they are not under threat. Placing some black paper across the back of the tank will make them feel more secure without making it difficult for you to observe them. Many tropical fish hatch with yolk sacks still attached - round bulges underneath their bodies - and will digest these during their first few days of life, as they learn to find other food. For this reason you shouldn't worry if, at first, they seem to get smaller. 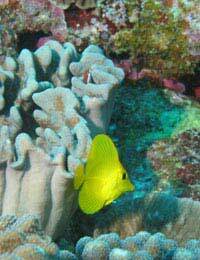 In the wild, baby fish seek out small particles of matter, algae and plankton for food. If you keep them in your main aquarium they will usually be able to find enough such debris left by your other fish. In a separate environment, you will need to provide it for them. The best feeding option for baby fish is specialist fry food, which comes in tubes in liquid form and can be squirted into the water. Because they are so small they should be fed at least four times a day, at regular intervals. Follow the instructions on the food you buy; if the water stays cloudy, you are feeding them too much. Not every local fish shop sells fry food, so you may need to order it in (it's worth keeping some around at other times, too, because it can be good for convalescent adult fish). If you can't obtain any in time for your new babies, you can feed them small amounts of hen's egg yolk dripped into the water. As your baby fish get older, they will become ready for other kinds of food. The important thing is to feed them a balanced diet. Ground-up flakes are good for most species. Ground-up algae discs work well for young vegetarian fish and a piece of sausage suspended in the tank with string will be a popular snack for young carnivores (just don't leave it for more than two days). Where humans invest a lot of energy in producing a small number of offspring and working hard to ensure they survive, most species of fish apply a different strategy, having lots of offspring with a relatively low survival rate. This means that you shouldn't be surprised, or feel bad, if the majority of your baby fish fail to reach adulthood. The rate of serious mutation in baby fish is far higher than in baby mammals (which don't usually make it to term if they have serious problems). This means you may find yourself dealing with severely disabled fish who cannot survive more than a few days - they may not even be able to eat. Many aquarists feel that the kindest thing to do is to put these fish out of their misery by feeding them to bigger fish. With enough care and attention, you should be able to raise some of your baby fish to adulthood. If you don't have room to keep them all, your local fish shop may be willing to buy some, or you can help your friends discover the delights of fishkeeping.